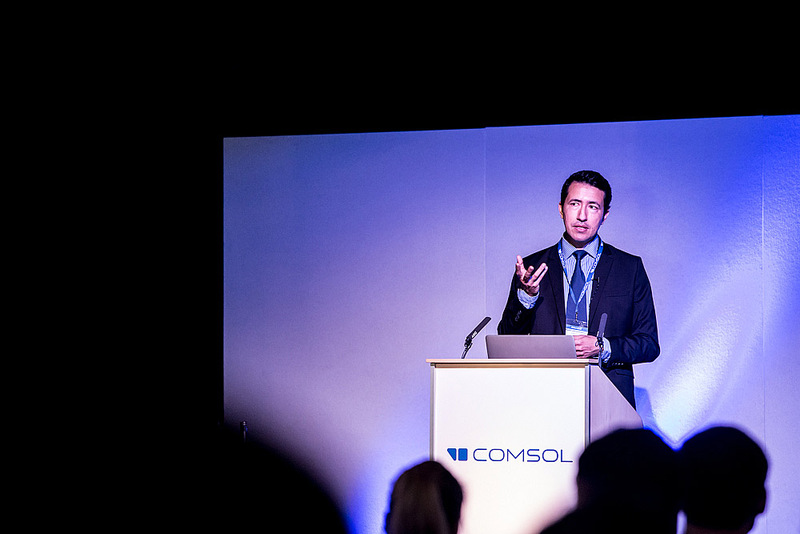 The COMSOL Conference 2014 kicked off with its first stop last month in Cambridge, U.K. Among other things, attendees were treated to three keynote speeches from prominent COMSOL Multiphysics® software users: Whirlpool R&D, Bang & Olufsen, and Xaar. First up of the COMSOL Conference 2014 Cambridge keynotes, Nelson Garcia-Polanco shared results from the Whirlpool R&D contribution to the GREENKITCHEN project. Keynote speaker Nelson Garcia-Polanco of Whirlpool R&D. GREENKITCHEN is a project for reducing the energy and water consumption of home appliances in Europe. As an industry partner of the project, Whirlpool plays their part of working to improve the energy efficiency and cooking performance of domestic electrical ovens by way of multiphysics simulation. Why focus on the oven? According to Garcia-Polanco, that’s the least energy efficient appliance in the kitchen. In fact, he said that only 10 to 20% of the energy used actually cooks the food. The rest is wasted energy. At the beginning of his keynote, Garcia-Polanco showed us a photo and asked, “What can you see in this picture?” I immediately recognized it as the oven with a brick baking inside as seen in my colleague Alex Foley’s blog post “A Recipe for Success at Whirlpool Corporation“. Photograph provided courtesy by Whirlpool Corporation. Of course, Whirlpool did not have a bizarre craving for baked bricks. 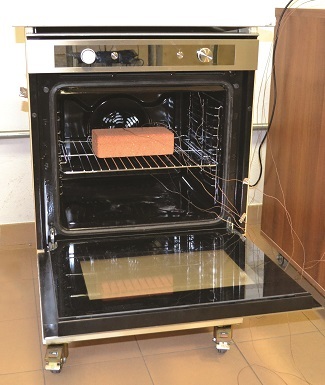 This is one of their test ovens used for recreating the standard test for measuring the energy consumption of European ovens, the normative oven energy class test, EN 50304. (The standard test is not only used for electrical ovens, but also gas and microwave ovens.) By baking and studying the brick, the research team could gather experimental data on the evolution of the temperature inside the brick and how much water evaporated. They then used their data to set up an accurate model recreating the standard test of the electrical oven in COMSOL Multiphysics. The model was created to enable parametric analyses of the glass emissivity, cavity wall dimensions and material properties, and heating elements design. Model taken from the keynote presentation and provided courtesy by Whirlpool Corporation (Copyright (C) 2014 Whirlpool Corporation). 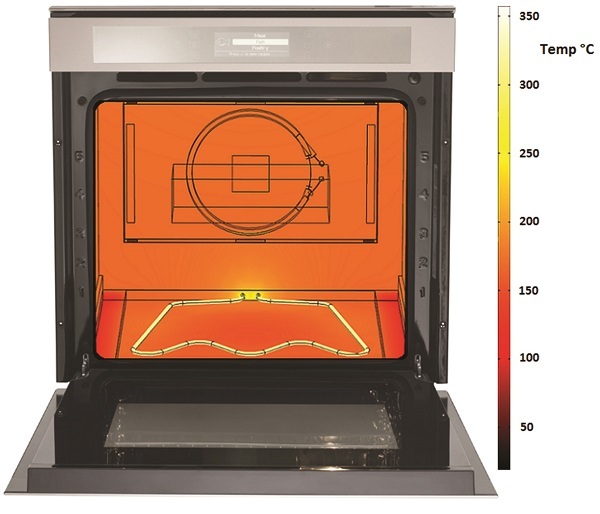 Using numerical simulation, Whirlpool tests new developments, designs, and materials with the goal of improving oven performance. When they compared their model results with the experimental data, they noted that they were a close match. They had predicted 166 grams of water in the brick with their model and the experiment resulted in 171 grams. As for the reduced energy consumption, they’re testing a lot of solutions. So far, they have been able to reach energy savings of close to 15% — 5 percentage points away from their target of 20%. The second keynote of the day was held by Martin Olsen of Bang & Olufsen (B&O). He presented their work on acoustics simulation in automotive listening spaces, with slides so beautiful our CTO, Ed Fontes, wouldn’t stop talking about them even long after the speech. A design-driven company, it makes sense for B&O to care about their slideshow as much as they care about their products. If you’ve ever seen a piece of B&O technology, I bet you didn’t just disregard it as purely functional — I bet you admired the design. At the same time, this company does not support the notion that form is more important than function. Bang & Olufsen engineers work hard to ensure their audio and video (A/V) products not only look good, but work well too. This became quite clear as keynote speaker Martin Olsen walked us through their simulation project on optimizing loudspeakers in cars from concept phase to development to research. 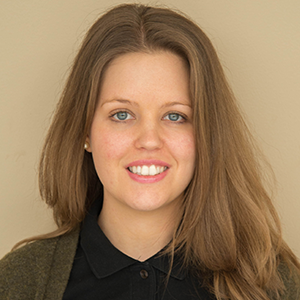 According to Olsen, the interesting thing about simulating acoustics is that you always have to consider the person listening to the sound waves that are emitted from the loudspeaker. 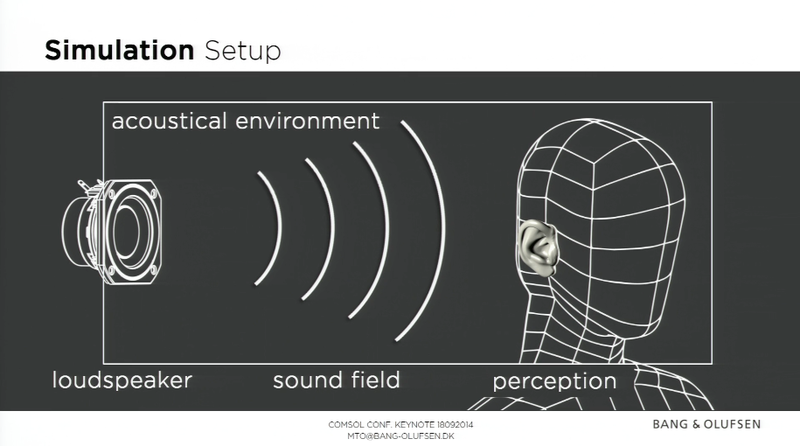 Slide taken from the keynote presentation and provided courtesy by Bang & Olufsen (Copyright (C) 2014 Bang & Olufsen). He referred to the first item, the grills, as their “artistic canvas”. This is where B&O engineers must find the optimal compromise between beautiful design and high acoustical performance. Why the compromise? Well, the loudspeaker grills may look nice, but they can also degrade the sound since they cover the loudspeaker. By way of multiphysics simulation, they can study the interference between the loudspeaker and the grill and optimize the grill design. The acoustic lens is one of their key technologies. The acoustic lens is typically mounted on the dashboard of the car and directs sound at high frequencies. The sound emitted upwards from the loudspeaker is reflected out by the lens in the horizontal plane. The way the sound is distributed within the car can be controlled based on the design of the lens. Again, they can use simulation to ensure proper reflection of the sound. The third aspect of automotive acoustics is the full car compartment. As Olsen put it, this is a complex listening space. Because their job is to determine the best loudspeaker layout in the car long before the car actually exists, a simulation platform like COMSOL Multiphysics comes in handy. In order to predict the sound behavior in a brand new car that still only exists as a blueprint, they needed to turn to simulations and visualize the sound rather than hear it. They use their 3D models to test different loudspeaker layouts based on sound zones. For example, the people in the front seats (zone 1) of the car might listen to navigation or the radio, while passengers in the back (zone 2) are enjoying movies or music. With the models, they can analyze what happens when they put woofers throughout, surrounding the passengers in both zones, or when they put them inside zones. You can get a glimpse of the results in the picture from the presentation, below. To simulate all of the aspects of automotive acoustics, they used COMSOL Multiphysics® together with the Acoustics Module, Structural Mechanics Module, Optimization Module, and LiveLink™ for PTC® Creo® Parametric™. Keynote speaker Martin Olsen of Bang & Olufsen. 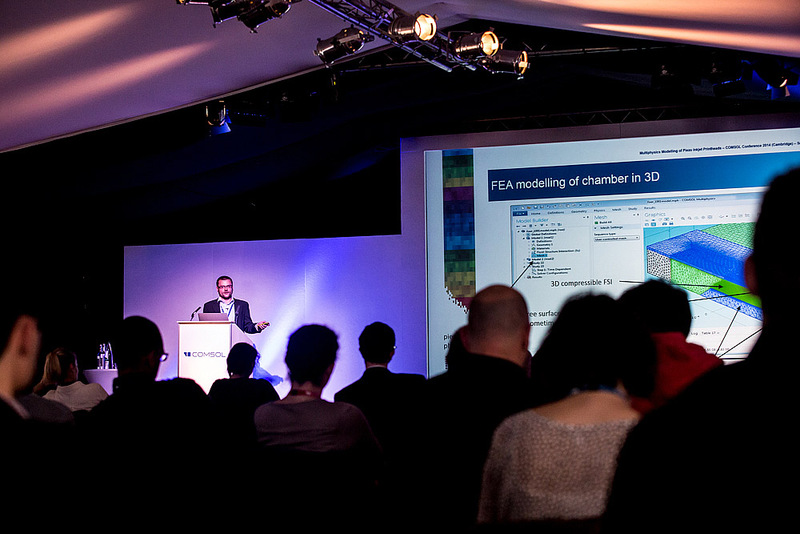 The final keynote of the COMSOL Conference 2014 Cambridge was held by Peter Boltryk and Mani Sivaramakrishnan of Xaar. These two keynote speakers showcased their piezo inkjet printhead modeling work. Keynote speaker Peter Boltryk of Xaar. As we saw at the conference, piezo inkjet printheads are quite complex. Modeling these requires the coupling of acoustics-structural interaction, single- and multiphase fluid dynamics, heat transfer, and structural mechanics. The printhead technology lays down inks and other fluids in the most effective and reliable way possible, with precise drop volumes, highly accurate drop placement, high-frequency jetting, and variable drop size capability. As a manufacturer of this type of industrial printhead, Xaar needs to understand the underlying physics in order to optimize the design. 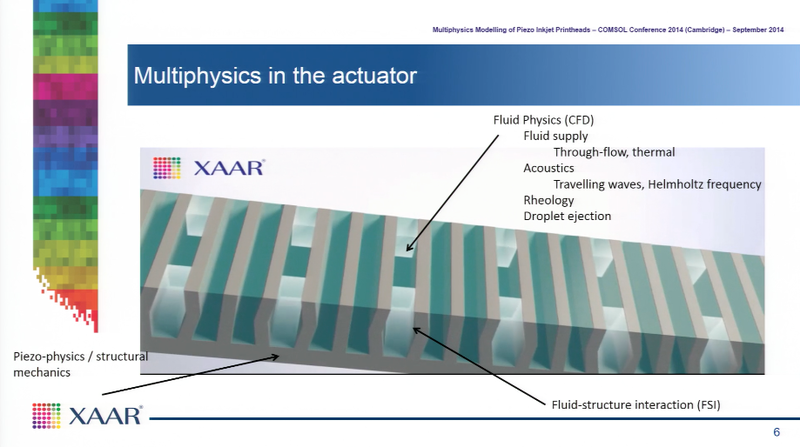 Xaar uses multiphysics modeling for various reasons in research and development. Modeling enables them to learn about the underlying physics in actuation and jetting. It also becomes a guiding tool for the low-level actuator design based on target performance and for higher-level design, e.g. interfacing with electronics, fluidic manifold, etc. Furthermore, they use it to drive waveform optimization and to guide testing, which, in turn, can help fine-tune the models. To understand the highly complex underlying physics, Xaar’s R&D engineers employ finite element analysis (FEA) methods. During the presentation, Boltryk and Sivaramakrishnan discussed some of these FEA methods: 3D coupled models, jetting model, and piezoelectric physics. Slide taken from the keynote presentation and provided courtesy by Xaar (Copyright (C) 2014 Xaar). In order to reach design solutions quicker, Xaar engineers sometimes utilize reduced-order modeling techniques. To validate and calibrate these models, they then had to turn to a finite element solver: COMSOL Multiphysics. 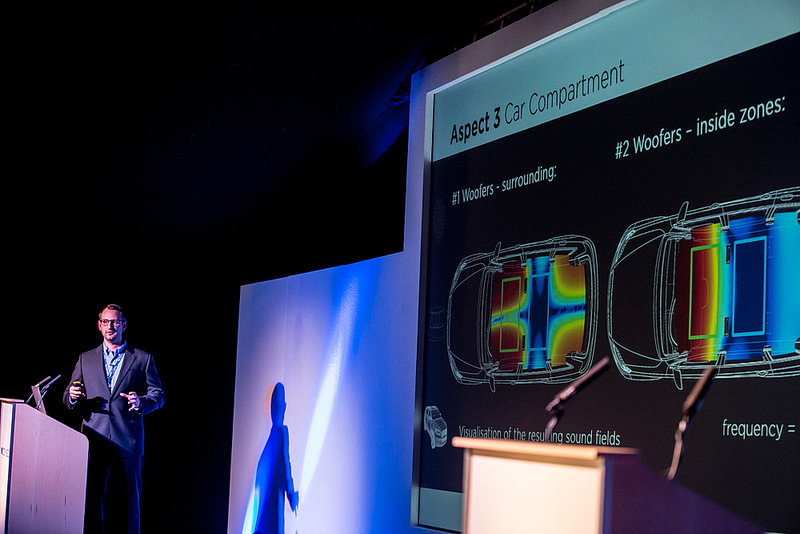 All-in-all, the COMSOL Conference 2014 Cambridge went really well. In addition to hearing about the wonderful projects our users have been working on, we learned where the next European COMSOL Conference will take place: Grenoble, France. I hope to see you all there in 2015. The COMSOL Conference 2014 tour has only just begun. Next up, we’re going to Boston, MA, USA. We’ll be live-tweeting from there as well, using the #COMSOLconf14 #Boston tags.